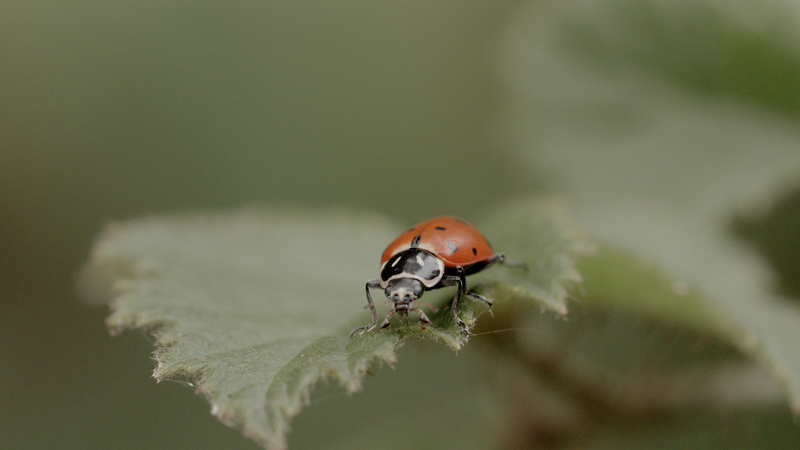 With their charming spots and bright red bodies, ladybugs are pretty hard to miss. We’re used to seeing them alone, picking off sap-sucking aphids in the garden. But at certain times of year, ladybugs head for the hills to assemble in huge groups, called aggregations, clumping together in layers several bodies thick. This arresting, almost uncanny sight—roiling masses of tiny red bodies jostling for position on rocks, logs, and branches—is typical of the “convergent” ladybug whose range covers a great deal of North America. 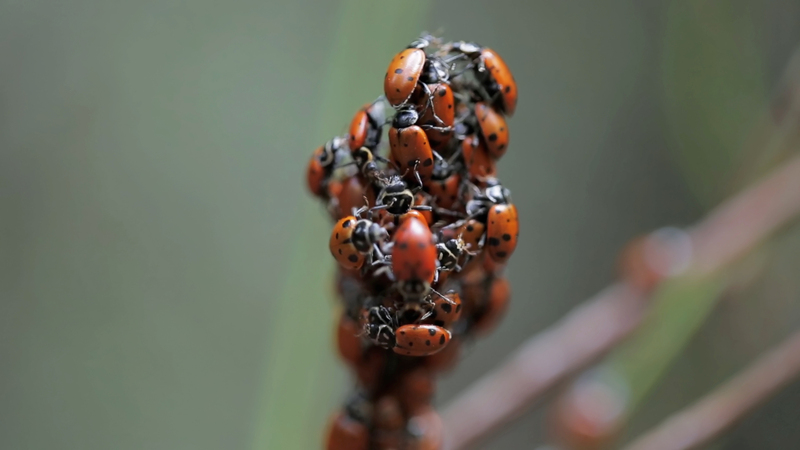 In the Bay Area, one of the best places to view ladybug aggregations is Redwood Regional Park in Oakland. Between November and February, numerous points along the park’s main artery, the Stream Trail, are swarming with the insects. Scientists believe the behavior evolved as a way for a solitary species to reproduce and to cope with a limited winter food supply. After fattening themselves up, and before bedding down for winter, these ladybugs are getting together to take care of some final business—namely, mating. Ironically, convergent ladybugs, which are actually beetles, are not named for this behavior. The word “convergent” in their name refers to the characteristic white lines behind their heads. In California, ladybugs spend most of the year on crops in the Central Valley, or on domestic garden plants, feeding on aphids. When the weather starts to turn chilly, however, the aphids die off in the cold. With food becoming scarce, the ladybugs take off, flying straight up. The wind picks them up and carries them on their way, toward hills in the Bay Area and coastal mountain ranges. Pheromones left behind in the mountains from previous aggregations lead these newcomers right to the best wintering spots. 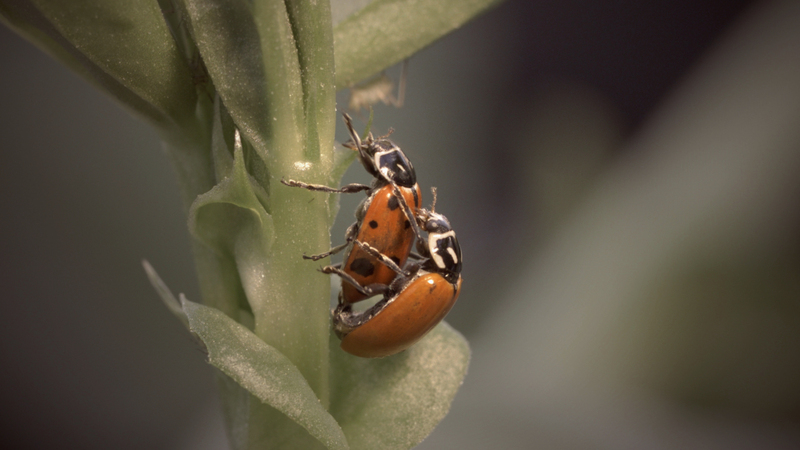 One type of chemical even comes from the ladybugs’ feet. “Wherever they walk, they leave behind a chemical trace. These sites are covered in it,” said Wheeler. As the ladybugs trickle in one by one, the aggregation grows. While these gatherings might seem to make the ladybugs more visible, and therefore more vulnerable to predators, the opposite is probably true, scientists say. Their higher numbers serve to magnify the warning broadcast by their red color. “Predators have evolved to avoid that kind of visual signal,” Wheeler said. And that red color is no red herring. “They truly do taste bad. In high enough concentrations, they can be toxic,” he said. Within the ladybug clumps, the movement is scrambling and unpredictable, not hierarchical like in a beehive or ant hill. Scientists think that the females—about half of the population, all of them previously unmated—may be selecting mates amid the chaos. Finally, the beetles hunker down underground, entering “diapause” or deep hibernation. Chemical changes in the ladybugs’ bodies prevent them from freezing or drying out. They can stay underground safely, even covered in snow, for up to three months. When spring arrives, warmer daytime temperatures urge the dormant aggregators to venture forth and return home, where a diet of aphids awaits.